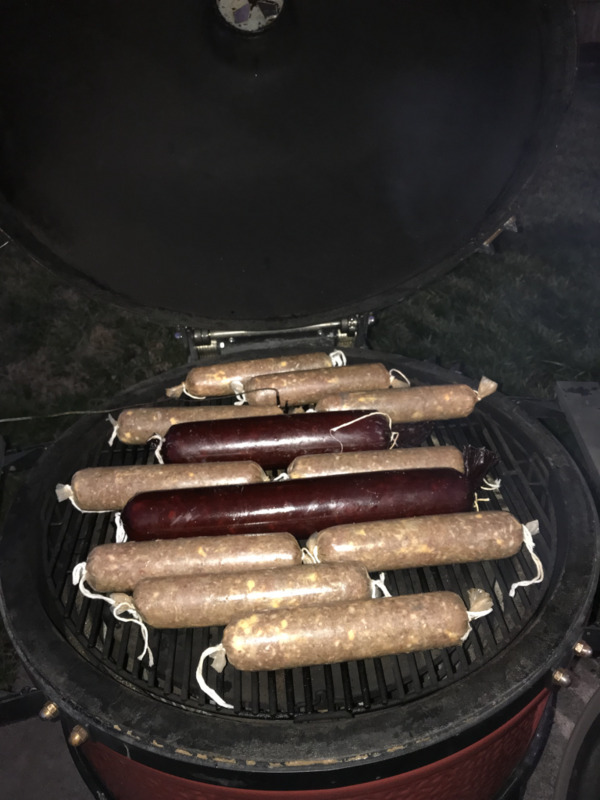 I tried my single largest batch of venison sticks. Every thing is mixed, but when I started stuffing them a big problem arose. The kitchen aide stuffer just wasn't able to push through enough, and it ends up making a mushy mess. So I ordered a new stuffer that should be here Tuesday. Does anyone see any problem with my leaving the meat sitting in a zip lock bag until Tuesday evening to case? I am using a 25lb Walton's snack stick kit with carrot fiber rather than sure gel? I don't think anyone wants to venture an opinion. It's hard to know what all happened, what's in the kit, how you handled it during the mix and after. Temperature of raw meat is very important. It can be offset by cures but.........? I understand. I am hoping to hear from Waltons. As a side note, any one in the Hampton Roads are of Virginia have a stuffer I could borrow? It is not going to hurt the meat, but as it sits there, with protein extraction and the cure beginning to work, the meat is going to become very tough after a couple days. There’s a very good chance it will be so hard that stuffing it may become impossible. It will still be very edible, but there’s a good chance stuffing won’t be possible. I will let you know how it ends up. If is is way too stiff to run thru stuffer (and I expect it will be after the proteins has set being both in the fridge and a day or two later) then roll or form the meat batter by hand into ropes on the counter and/or lay it on a sheet tray on parchment and roll it out flat as a sheet and the cut it into strips. Then smoke after that like it was a cased stick. Last batch I made of snack sticks stuffed into 19 mm casings was really tough on my 5 lb Northern Tool stuffer even as a fairly wet mix and did not play nice with the delrin drive gear on the crank shaft. Small casings and/or smaller tubes have a LOT of back pressure. Even the bit larger typical stick sizes will tax the stuffer vs. say a 30 mm casing. I decided to not try the stuffer, and just did them all by hand. Thanks for your help!